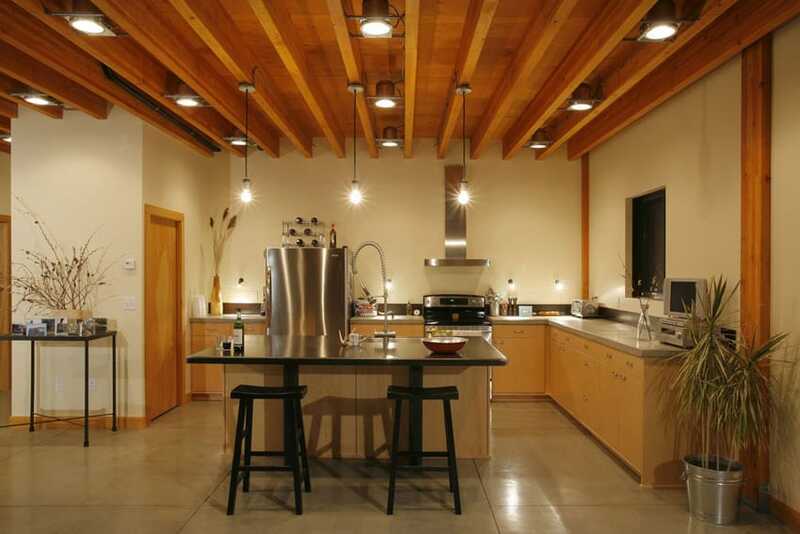 This gallery features some of our best modern kitchen design ideas. These pictures offer a variety of modern and contemporary kitchens with luxury furnishings such as high end cabinets, stylish finishes, stainless steel appliances, counter top materials, tile and wood flooring. Take a look at these modern interior designs and pick the one that’s your favorite. 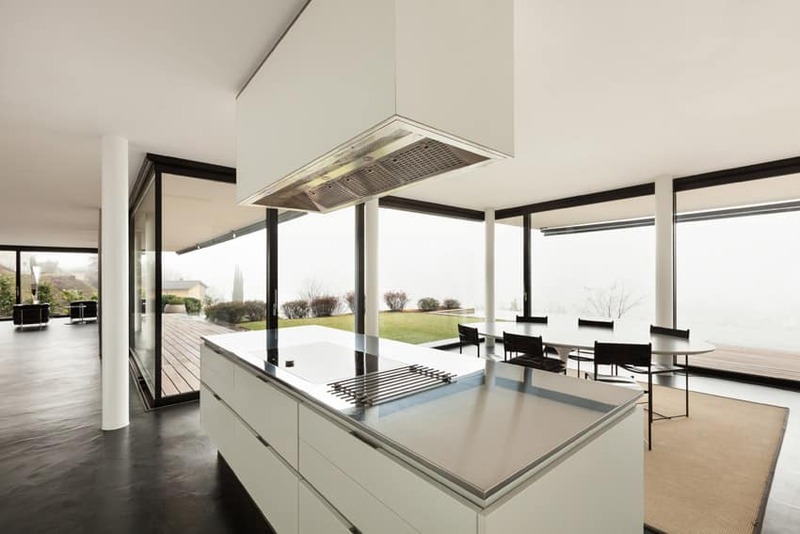 The modern kitchen shown in the picture above has simple clean lines and smooth surfaces. The result is an excellent modern silhouette, while still retaining a homey and welcoming appeal with its use of wood cabinets and floors. 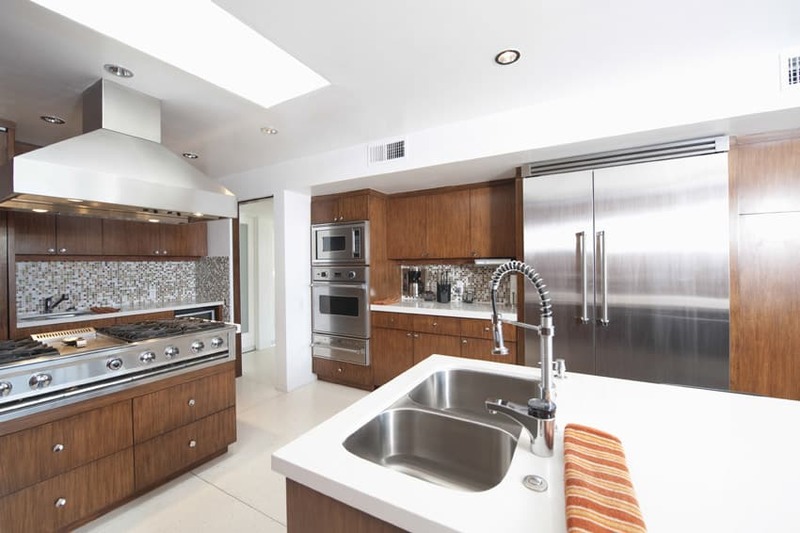 As you can see, the cabinets are made of solid Teak, matching the color of the solid wood floors. 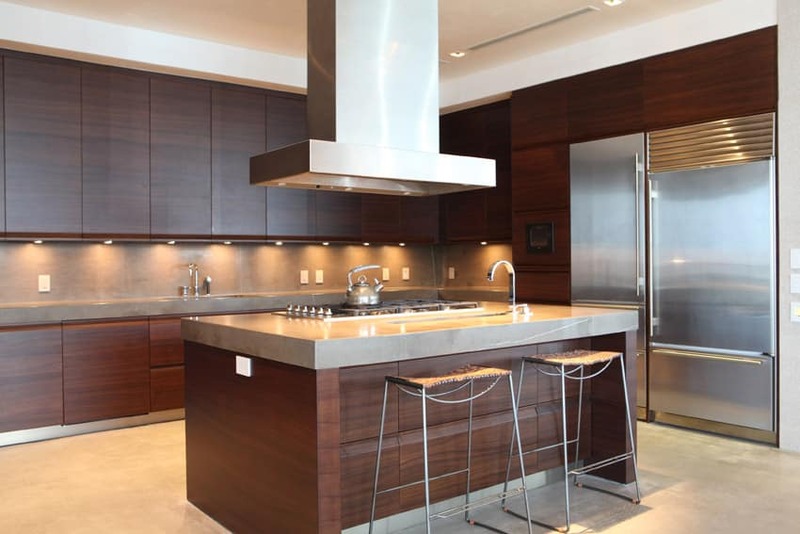 These teak wood cabinets are topped with stainless steel surfaces for the counter top instead of the conventional stone, and uses the same brushed stainless steel on its hardware and the kick space. The combination of these two materials create a modern look with a good amount of warmth and casual appeal. 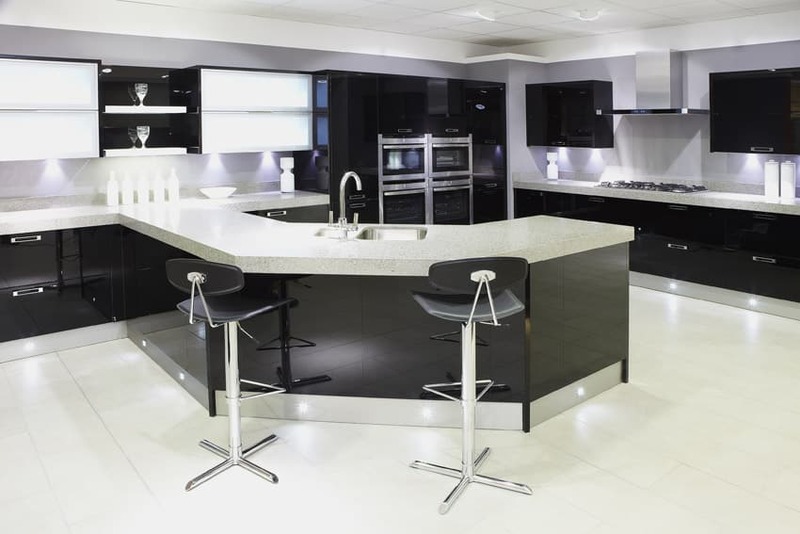 As a modern kitchen, black & white is a typical color scheme of choice in creating a minimalist modern kitchen. The monochromatic scheme is visually appealing and gender neutral and create a very clean and crisp looking kitchen. 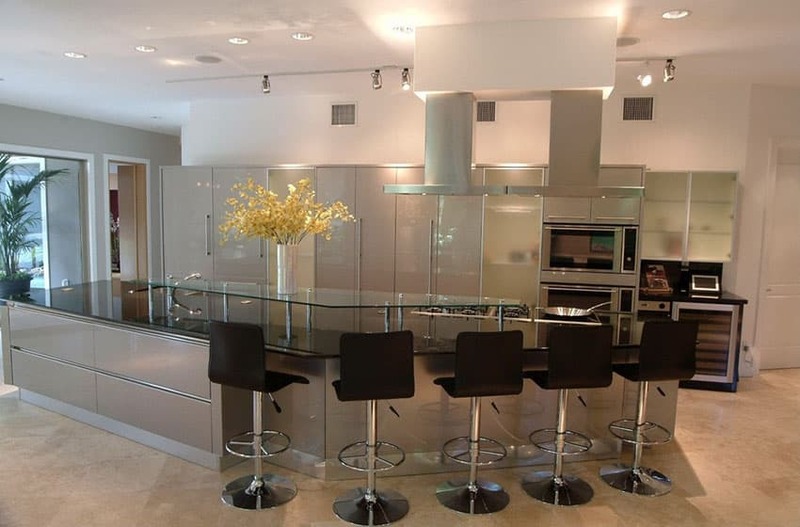 Laminated high-gloss black cabinets were combined with off-white quartztite countertop. This is combined with aluminum framed white glass cabinets and stainless steel kickspace. Despite the monochromatic scheme of the kitchen cabinets, the walls of this kitchen uses a lilac paint color, adding a soft color to the space. With lots of natural light from the large windows and a high exposed ceiling, the space allows you to experiment with different finishes and colors without weighing down the space. 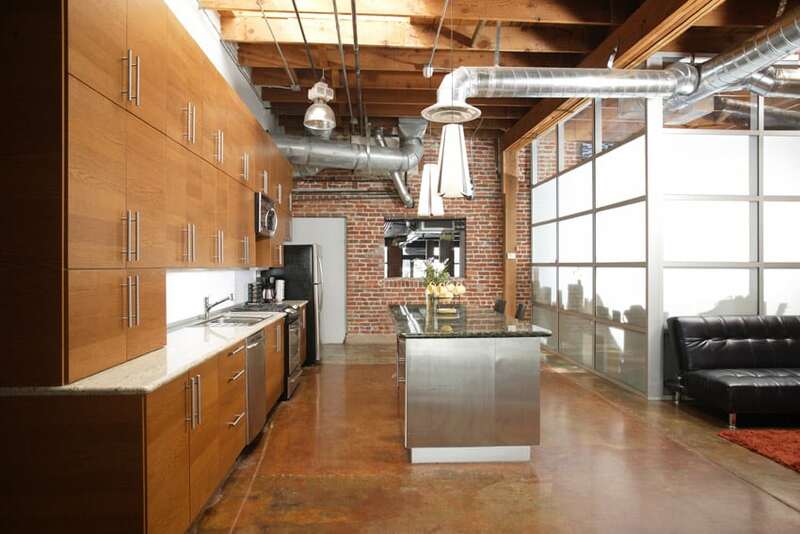 The kitchen and the over-all feel of the space goes for a more sleek industrial look. You will see a nice red brick wall, colored concrete floors, exposed wooden beams and trusses on the ceiling and even exposed pipes and exhaust. The combination of the raw gritty materials is a perfect backdrop for any industrial style space. The smooth chestnut laminated cabinets with white soapstone countertop and the stainless steel kitchen island topped with granite is a welcomed contrast to the gritty texture of the space. This is a small modern kitchen placed on an older style house helping it update its look, but at the same time, still retaining the color scheme of the space. 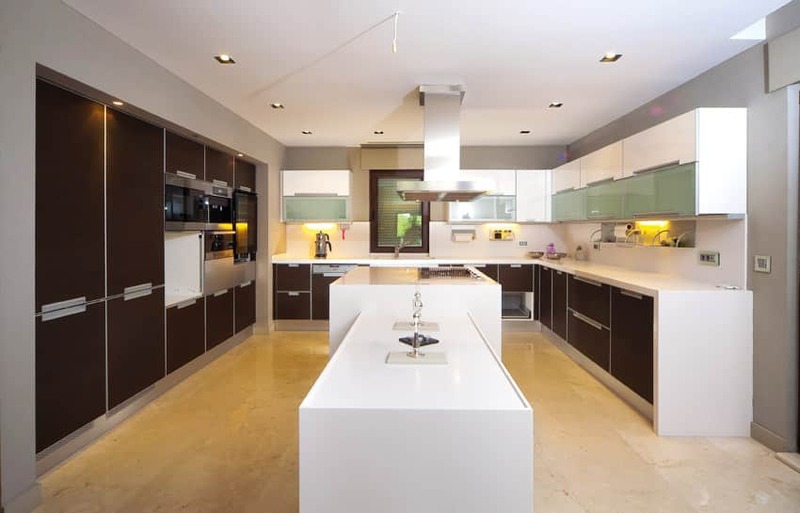 The walls and floors retains the existing ceramic tiles of the house, with the modular kitchen cabinets used are all in high gloss finish combining brown and light cream color. 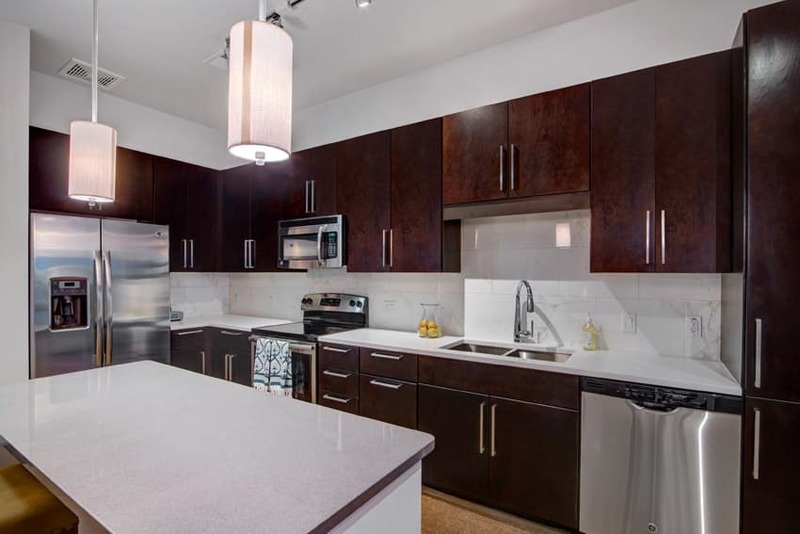 The base cabinets are brown and the overhead cabinets are in light cream, the counter top used is black solid surface creating a seamless work top, and is enhanced by stainless steel accessories hung on the backsplash wall. 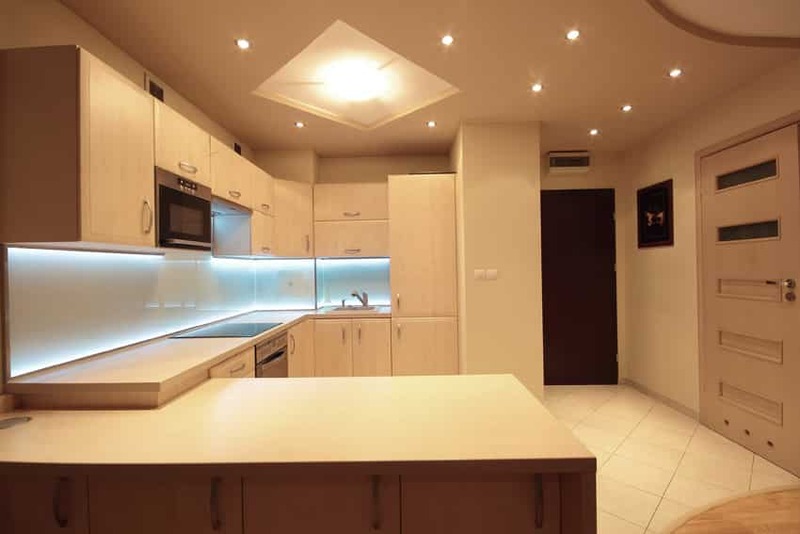 Despite being located in an enclosed space, this kitchen remains to be bright thanks to its adequate artificial lighting, giving you a very bright kitchen space which makes it easy to work on. The white floors and off-white walls also contribute to the brightness of the space. For the modular kitchen cabinets, all are laminated in a very light maple wood color, topped with white solid surface and paired with oatmeal colored graphicote backsplash. The light neutral palette makes the space easy to play around with, and gives you crisp-looking surfaces without being too plain. 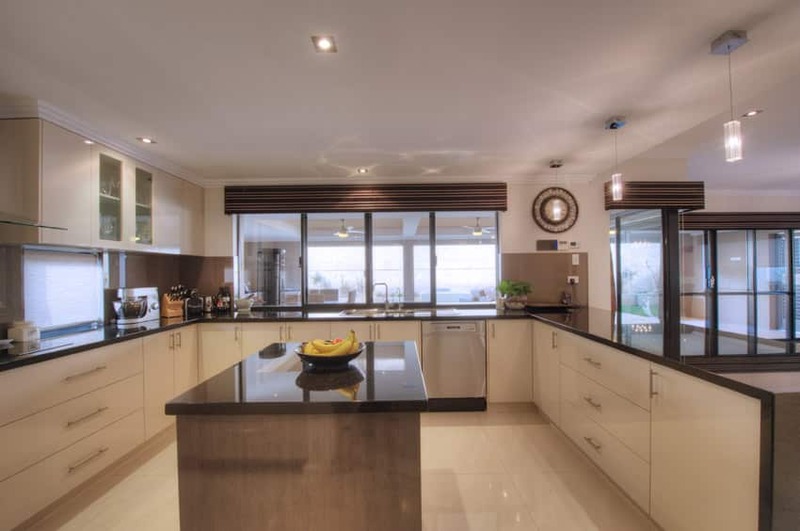 The appeal of this kitchen lies with its use of gorgeous solid Mahogany doors with a nice satin finish and visible dark wood grains, adding both warmth & texture to the space, as well as giving it an elegant appeal. No pulls or handles were used on all the cabinets, but instead makes use of drawer lips to create a make-shift J-channel to open the drawers and cabinet doors. This is combined with solid surface counters which mimics the look of raw concrete, adding a rough industrial feel to the clean surfaces of the cabinets. Using light gray walls instead of white gives you the same neutral background you can easily work with, but at the same time, makes the surface look softer without making the space look too dark. This large kitchen is a good example of such. Because the kitchen cabinets used is a combination of white and dark brown, gray is an excellent choice or wall color as it helps the white cabinets stand out against the walls, yet keep a nice and soft background to the space without attracting too much attention. The space is well-utilized, using one wall for a full-height kitchen storage, the other for L-shape kitchen counters. 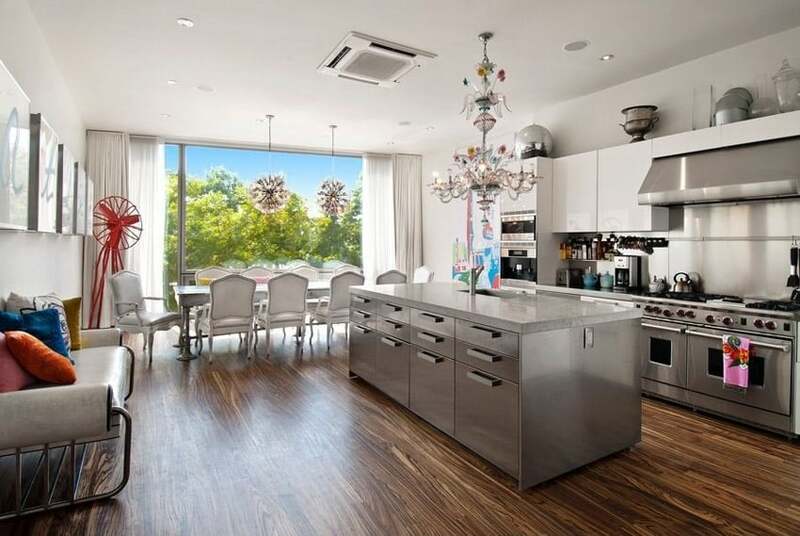 There’s also a large kitchen island connected to a small dining table/ledge. 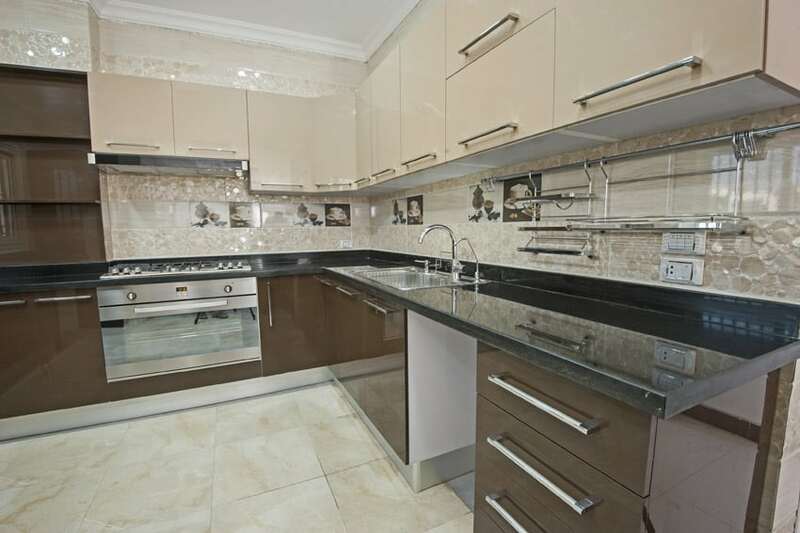 This is a very spacious full-sized kitchen which is able to maximize the space available for work tops and storage. Walls are all plain white and paired with very large porcelain floor tiles in off white. The kitchen cabinets are simply made from stained marine plywood pieces with a very simple plain profile, so it still gives that clean and modern look. For the countertop, the material of choice is white solid surface, and for the backsplash, mosaic tiles was used. 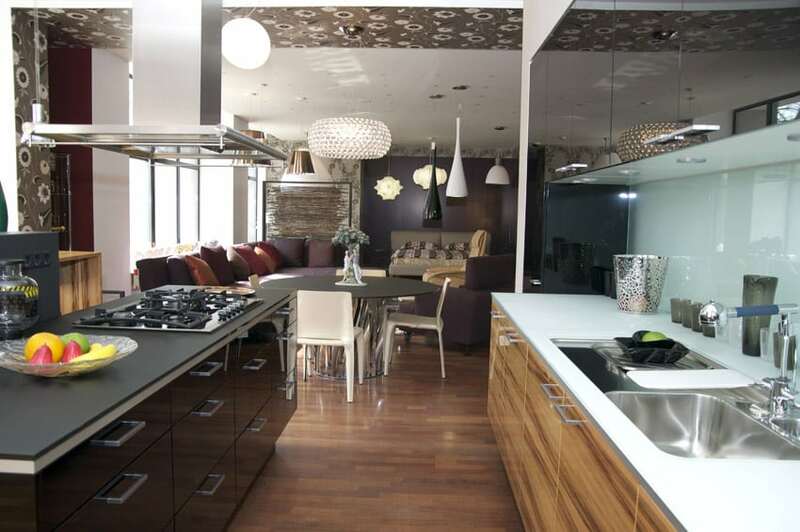 This modern kitchen gives you a masculine modern appeal with its combination of colors and finishes. The walls and even the ceiling is painted in black, while the floors are covered with dark red-orange ceramic tiles. The built-in kitchen cabinets against the wall are very unique – it has thin slats of solid pine, adding a warm burs of color from its natural wood finish which also adds the illusion of height to the kitchen because of the vertical pattern from the wood slats. At the center of the kitchen is an island counter clad in a concrete-like material. This is where the sink and the cooktop is placed, and above it hangs stainless steel shelves attached on the ceiling. This kitchen is neat and highly functional with ample cabinetry surrounding the room to hold kitchen suppliesand keep the place neat. Overhead and base cabinets in mahogany finish cover the walls. This dark color is contrasted by the solid white backsplash and countertop, the same solid white found on the kitchen island, with a cabinet underneath in the same shade as the others. The wooden laminates on the floor is stained in a lighter shade. Due to the very limited space, the storage is maximized on this modern kitchen. As you can see, instead of using laminated doors, it uses aluminum-framed frosted glass doors, giving you a little idea what’s inside the cabinets without completely exposing the items inside. It also integrates lighting inside the cabinet shelves via blue LED strip lights, giving it a nice light blue illumination. For the countertop, black granite was used, and all the working space was placed on the island counter, while most storage is on the wall counters. This modern kitchen adapts a paler color palette to compensate for its lack of natural lighting. The absence of natural light makes the space appear darker and smaller, so to counter it, walls and floors are kept basic white, and for the kitchen cabinets, natural beech laminates were used to give it a pale wood tone, adding a subtle texture. The counter top material is white solid surface, and the backsplash has integrated LED lighting behind the glass panels, helping illuminate the work top. 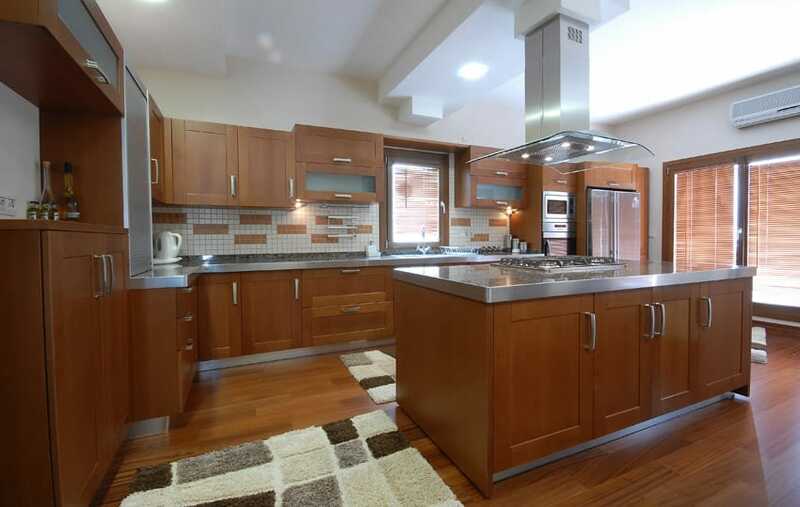 This modern kitchen effectively combines wood with plain modern finishes. 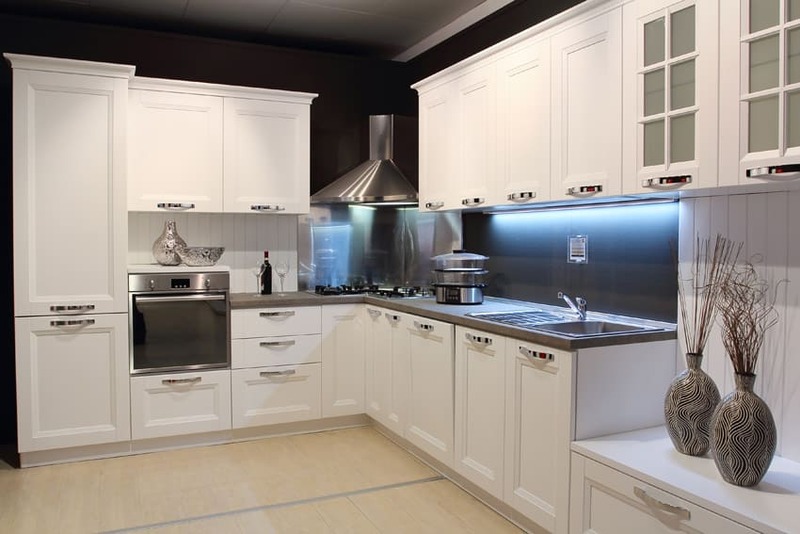 The kitchen cabinets is very basic and all white – white carcass & cabinets with white solid surface counter top. But to add a little twist, you will see that half of the overhead cabinets is laminated in chestnut wood and the backsplash material used is a unique winecolored graphicote glass. 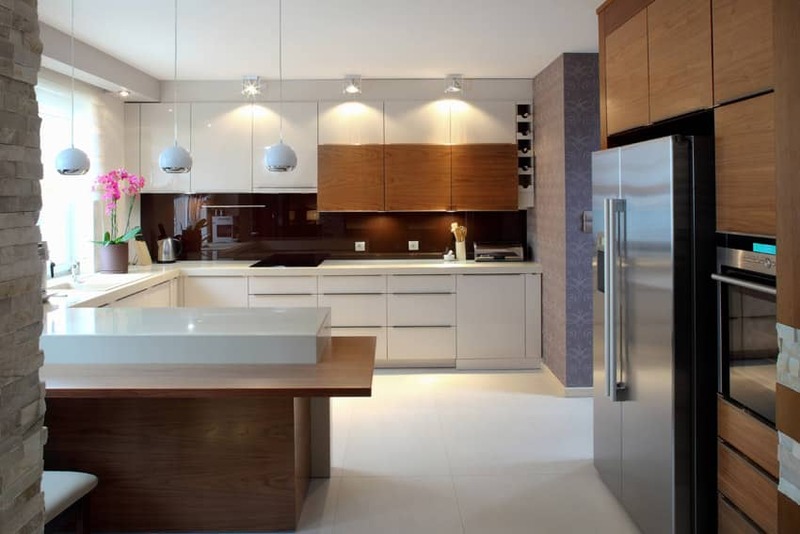 This modern kitchen gives off a neat and classy vibe with its glossy surfaces and solid colors. 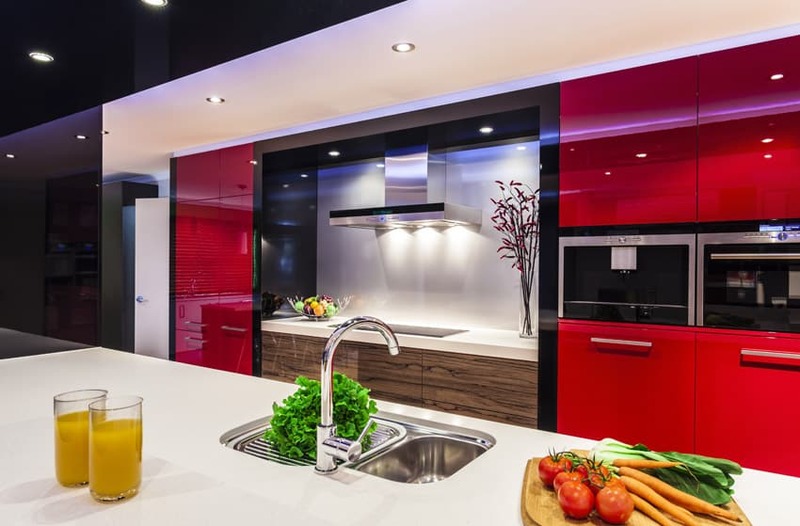 The countertops are in solid white finish, while the cabinets beside it are in solid glossy red finish with solid black outlines. There are a few base cabinets right below the countertop in wooden laminates, adding texture and life to this kitchen. Some fruits and other ornaments are placed in this kitchen for accent. The pale wooden floors sets a nice light background to accommodate the bold oranges used in the finishes for this kitchen. 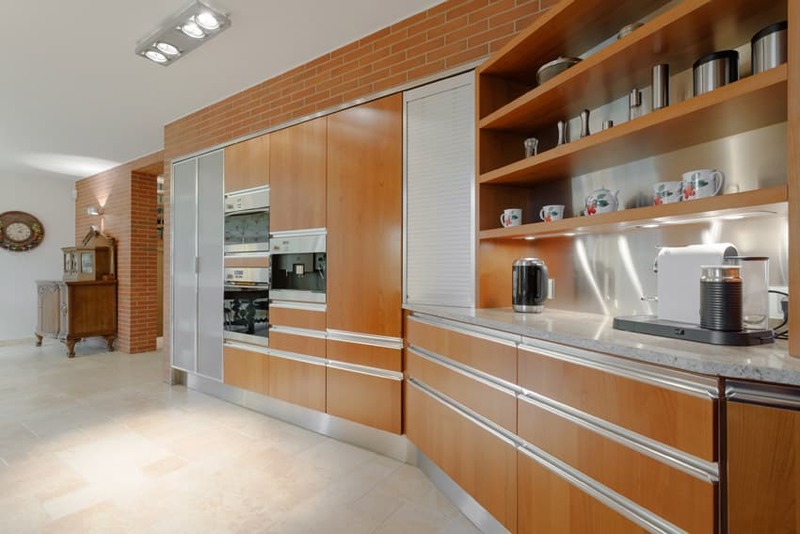 The walls are clad with bricks, adding both pattern and texture to the space, and to add to that, bold, pine-laminated cabinets were used, topped with light cream granite counter top and stainless steel backsplash. Taking advantage of the large available space and the light colors used on the walls and floors, this kitchen opts for a more traditional feel without the complicated turnings and carving details. The cabinets used are solid cherry wood topped with white solid surface. The dark red-toned cabinets has a nice contrast against the oatmeal colored walls and also matches the bent plywood dining chairs on the side. With lots of natural light and a bright white slate-clad walls, they were able to use darker-colored kitchen cabinets to create a classy and elegant kitchen without looking dated. 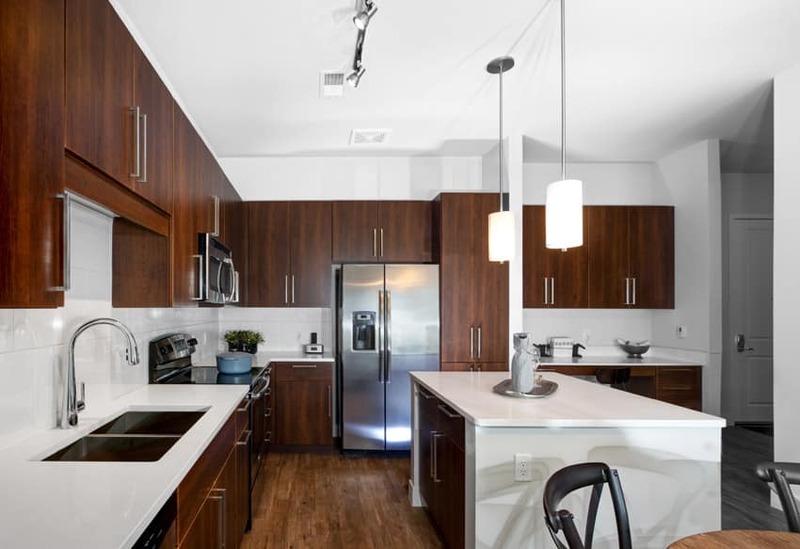 The kitchen cabinets are made from ribbon-grain plywood stained in dark mahogany and topped with white solid surface. It has a small kitchen island in the same dark mahogany finish, but the countertop used is stainless steel. This kitchen uses a unique laminate finish for its kitchen cabinets. It is dark red in color with a metallic pattern, giving the surface a unique look. As the kitchen cabinets are already bold by itself, the walls are kept plain white, and the counter top material is white as well. White subway tiles were used for the backsplash, giving a subtle pattern to the surface. 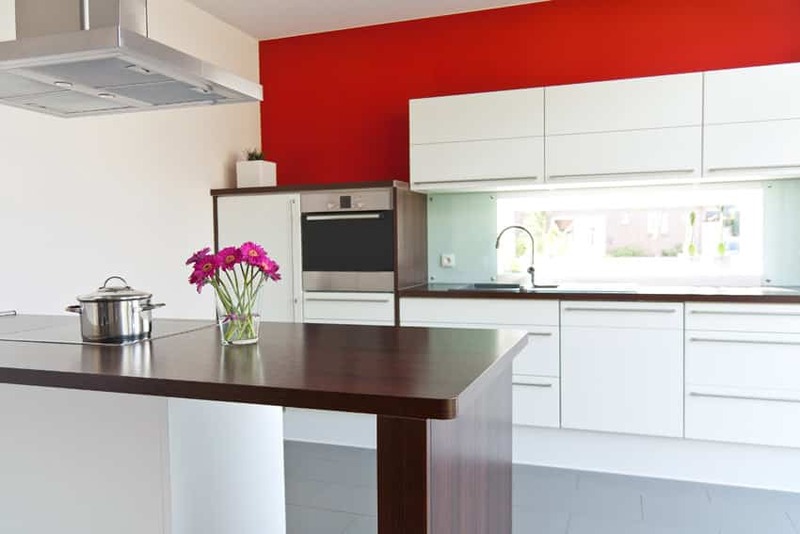 As the space has plain white surfaces, the kitchen is a little bit bolder, as it uses cherry wood laminates, giving a bright orange tinge to the space. This is topped with orange granite counters and backsplash, and combined with accents of solid wood butcher’s black and frosted glass ledge for a bar counter. 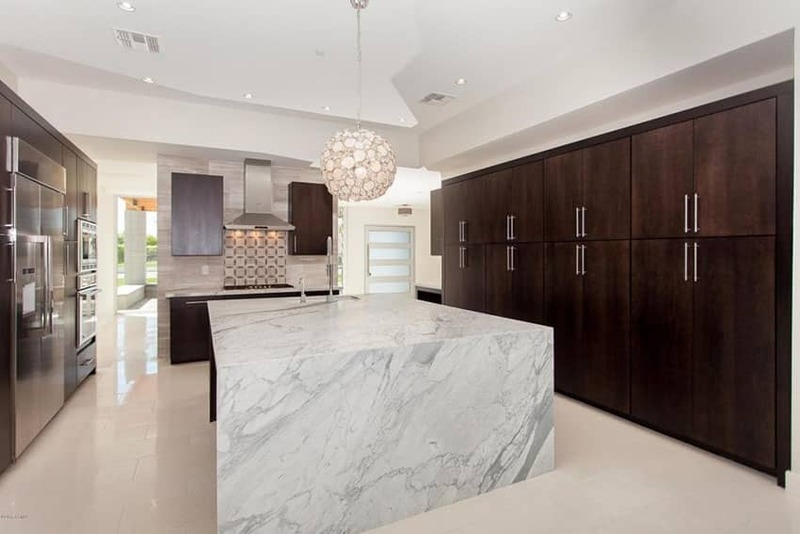 This modern kitchen with massive center island in marble makes a grand impression. With plenty of dark wood storage cabinets on both sides, beautiful stainless steel appliances, and high end metal fixtures this kitchen looks luxurious. The contemporary wire ball globe pendant light brings some extra glamour to the space to match the square back splash and glass pained door. This modern kitchen island has an extremely long surface area with plenty of room for eat-in dining and entertaining. The kitchen itself offers semi-transparent glass faced cabinetry with an under counter wine fridge and a six burner stove. 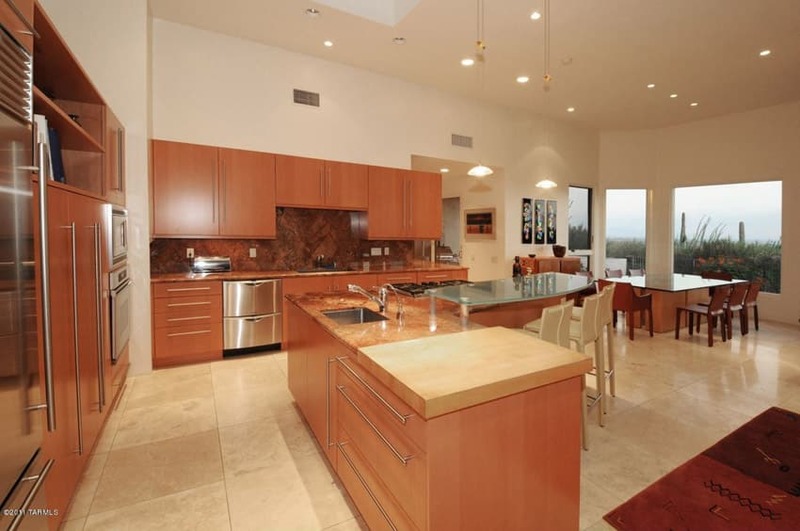 The travertine flooring, stainless appliances and recessed lighting give this space a high end feel. 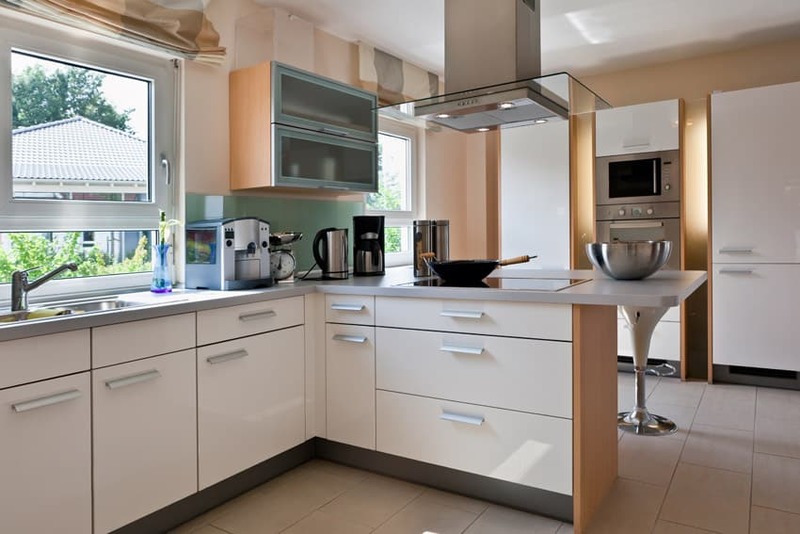 This small kitchen is placed on an interior with an open layout, making it look bright and big. The kitchen island is laminated in a light gray color and topped with light gray granite. The main cabinets on the other hand goes for a simpler white-laminated cabinets, combined with stainless-steel clad backsplash. 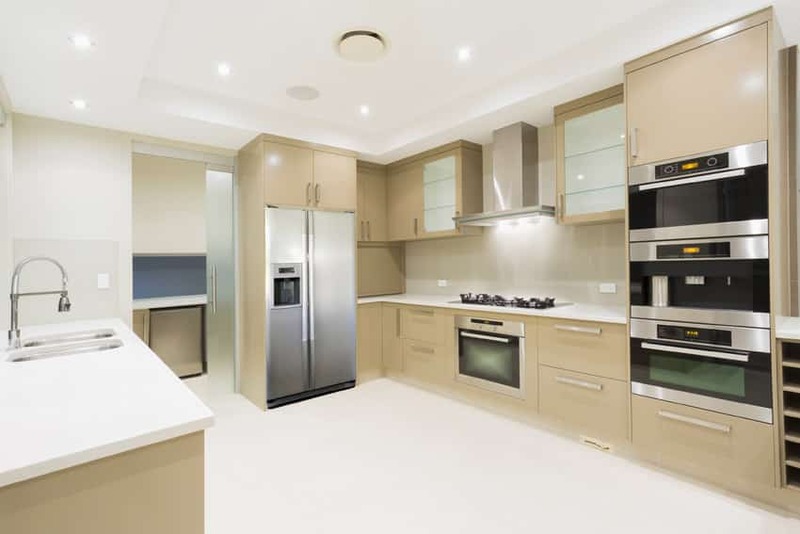 This kitchen is very practical when it comes to maintenance, as all cabinet doors and carcass is in stainless steel, making the kitchen look sleek and professional. The main kitchen counters uses white solid surface, while the kitchen island is topped with charcoal salt & pepper granite. To add a bit of color to the space, red granite was used for its backsplash, giving the cold kitchen a warmer pop of color. 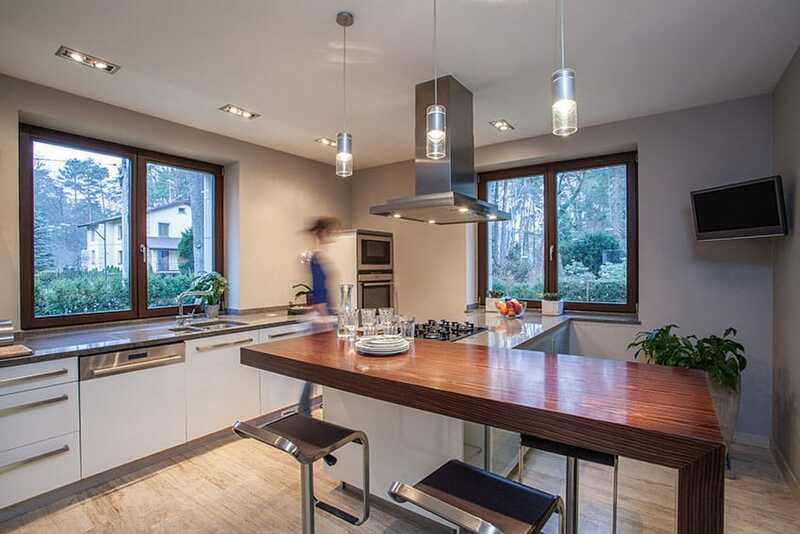 This modern kitchen has a very simple layout, brightly lit by windows and using a light color scheme. The modular cabinets used have white cabinet and drawer faces, and the side boards are laminated in wood tone finish, giving a variety of color and texture. For the counter top, gray solid surface was used. There is also a small bar counter area perfect to use as breakfast area or a quick lunch. This kitchen is straightforward and modern. It makes use of solid colors and seamless edges to create a simple and neat space. The overhead and base cabinets are seamless and in solid white, with long horizontal stainless steel handles. The mahogany countertop matches the surface of the kitchen island, and the presence of a wood texture adds life to the solid colors surrounding it. Aside from the solid white walls, other colors that may be found in the room is solid gray on the floor tiles, and solid red on the wall where the cabinetry is attached. This simple kitchen perfectly matches the minimalist architecture of the space, as well as its very simple black & white color scheme. Most of the walls have ceiling-height windows and doors, creating a very bright and open-looking space, helping maximize the view as well. The floors are black colored concrete, creating a unique sleek floor surface which helps the all-white laminated kitchen cabinets stand-out. Instead of traditional stones or solid surface, stainless steel was the material of choice for the counter top, creating a surface which is also easy to maintain and disinfect. 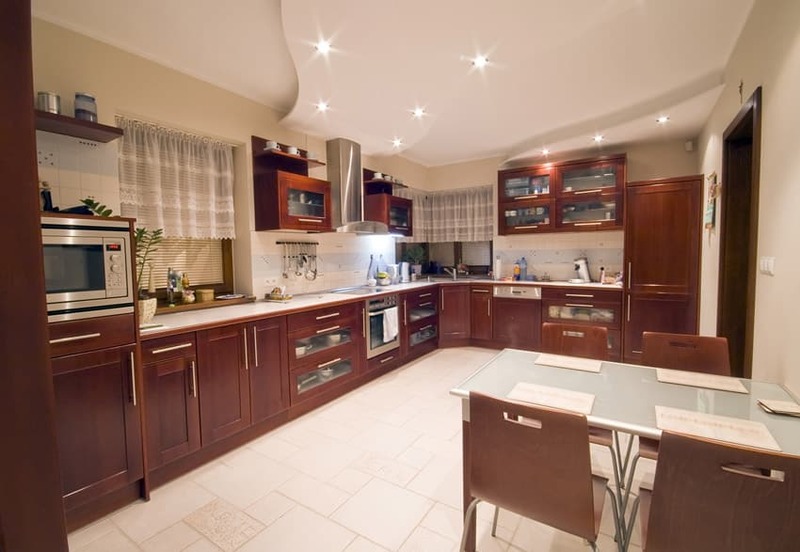 This is a spacious kitchen with an open floor plan and adequate natural light. 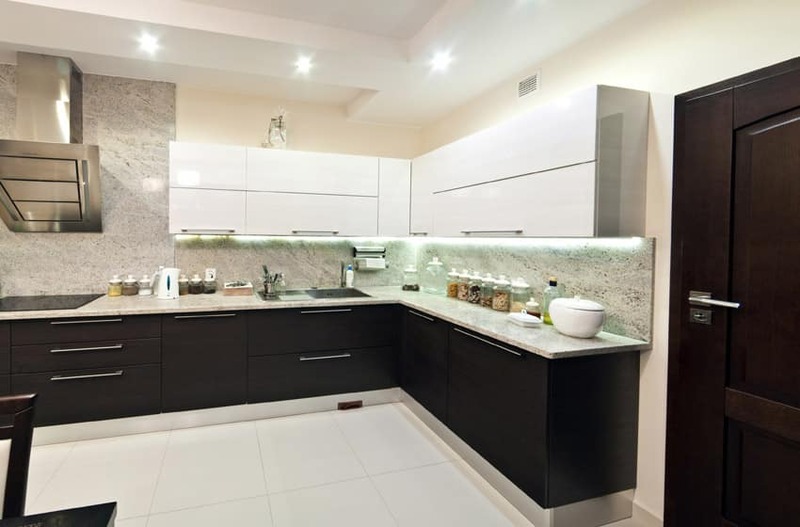 The cabinets are laminated in an off-white color and topped with black solid surface and placed against dark beige graphicote glass backsplash. There is a small kitchen island at the center with base laminated in beige and topped with the same black solid surface counters. 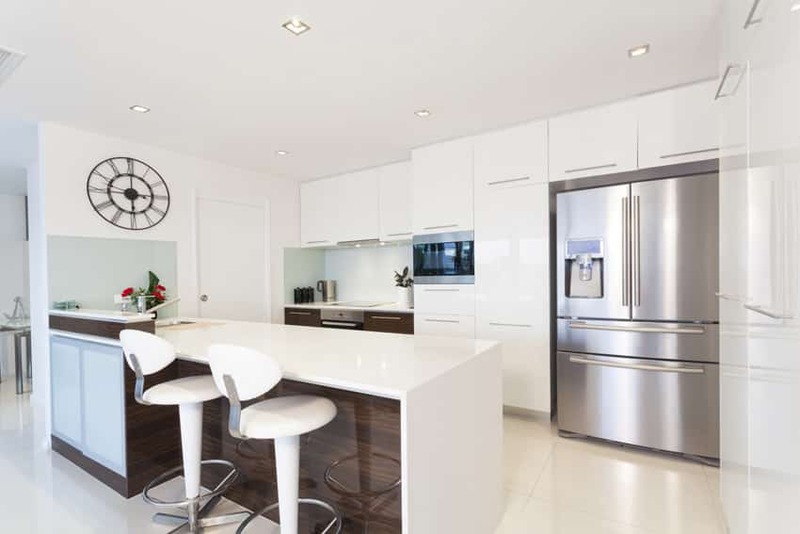 This is a simple and clean modern kitchen design which combined plain white glossy kitchen cabinets with glossy American-cherry laminated cabinets. To complete the clean minimalist look. the counter tops used white solid surface for that seamless worktop. This beautiful kitchen has a minimalist design, but the textures and colors that are used make it elegantly pleasant to the eyes. The overhead and base cabinets mirror each other; having the same number of drawers, dimensions, and design. It has a glossy oatmeal-colored surface, with black square knobs. The countertop is solid black. What is very noticeable is the golden bricks that clad the backsplash. This is illuminated by yellow lighting, creating a very elegant and golden gleam. The kitchen island holds the stove and has wooden laminates for the countertop. 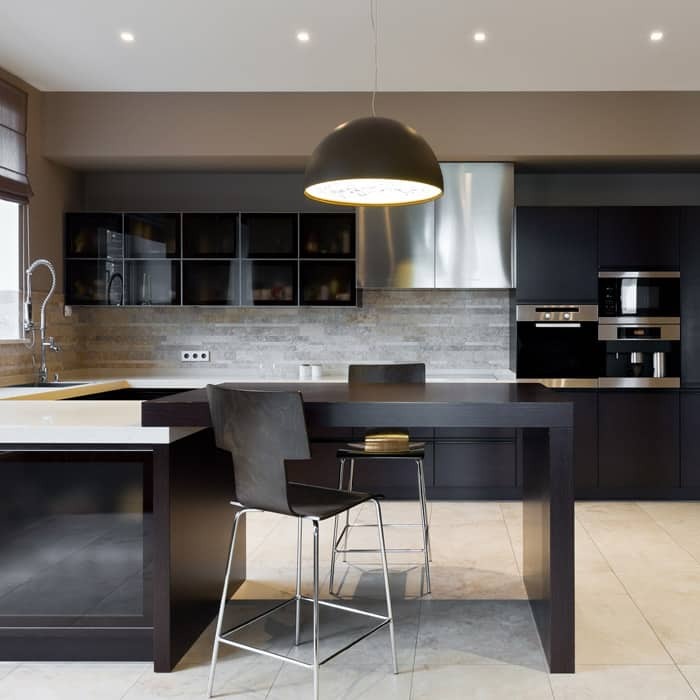 A modern kitchen in all black which creates a sleek minimalist look. The space has an open floor plan with lots of natural light coming in from the large windows and sliding doors, so despite using dark-colors for the kitchen cabinets, the space remains to be bright and spacious-looking. The modular cabinets are all laminated in black, topped with black solid surface countertop. It doesn’t use drawer pulls or handles, giving it a clean and seamless look. Additionally, storage space is maximized by the use of full height cabinets against the wall. 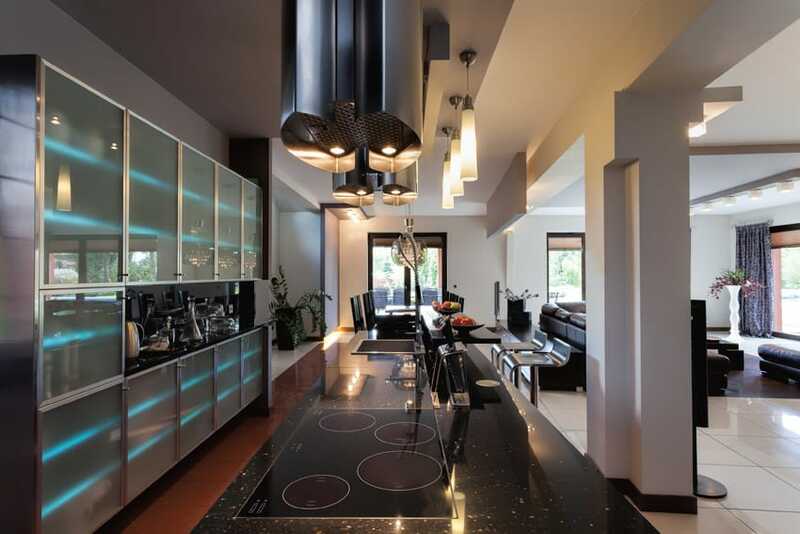 Achieve a sleek & modern appeal by using black-laminated modular kitchen cabinets. In this example, you will see that the black laminates used have wood grain texture on it to give it that nice matte and natural wood texture. This is combined with white solid surface countertop, light gray faux stone backsplash tile, glass and some stainless steel accents. Instead of using normal drawer pulls/handles, matte black J-channel pulls were used to emphasize its modern look. 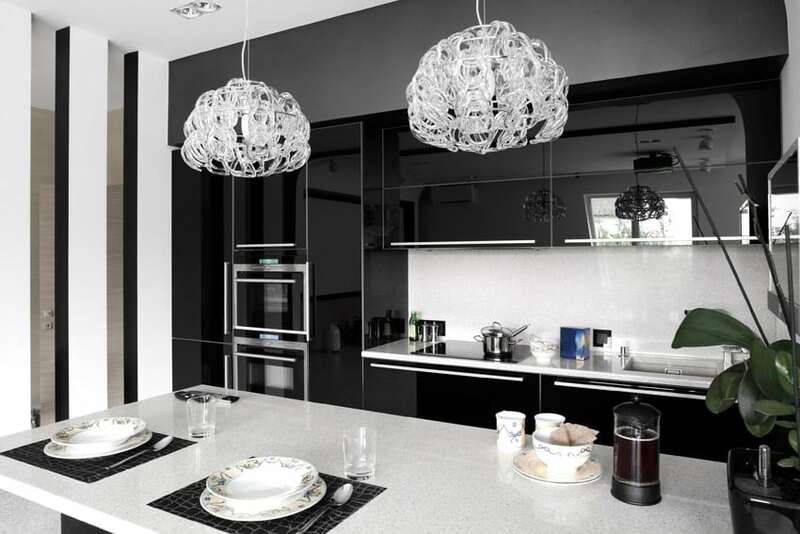 This grand monochromatic kitchen makes use of black and white colors to create a neat and classy kitchen. The overhead and base cabinets are covered in glossy solid black laminates, while the countertops and backsplash are in solid white. The simple elements are adorned with two beautiful crystal pendant lights covered in an intricate design. A plant could also e found on one side, adding life to the space. This kitchen follows a simple black and white colors scheme. 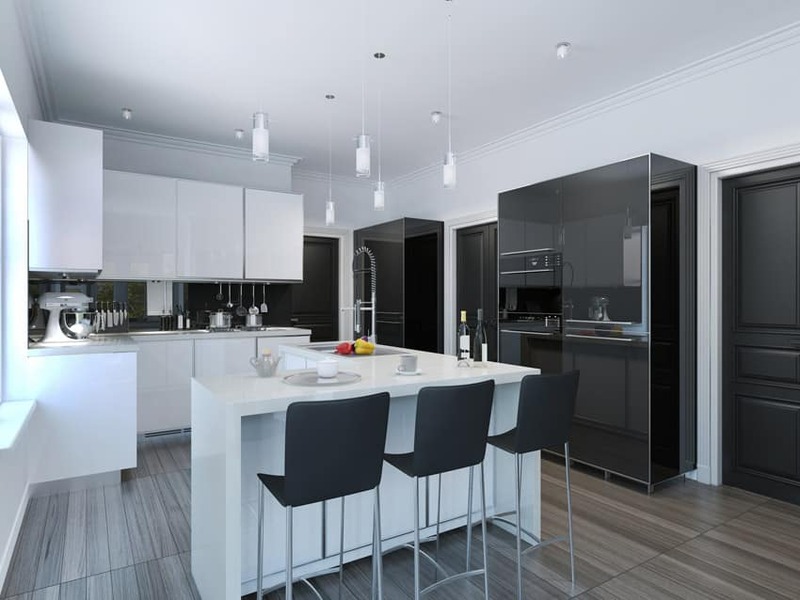 You will see that the walls are white and the doors are painted in matte black, and the kitchen cabinets on the other hand is also a combination of black and white cabinets but has a glossy finish instead. The main kitchen cabinet and the l-shape kitchen island uses aluminum-framed cabinet doors, solid white solid surface counters and black graphicote glass for its backsplash. The kickspace is clad in stainless steel, making it easy to maintain, and the full-height storage cabinets on the other side is laminated in black. The wood finish floor tiles in a grayish tone adds texture and pattern to the space, giving it more personality. A modern white and black kitchen design which adds a touch of attitude by adding an interesting natural texture into the design. While the cabinets are the typical modern modular cabinets – wengue base cabinets & white glossy overhead cabinets, it uses natural stone counter top and backsplash, which gives the space that additional personality by adding a natural gritty texture into the plain space. For people who find black a little too overwhelming, but find the dark crisp look it gives attractive, one color alternative would be charcoal – a dark shade of gray, almost black, but not as dark as black. 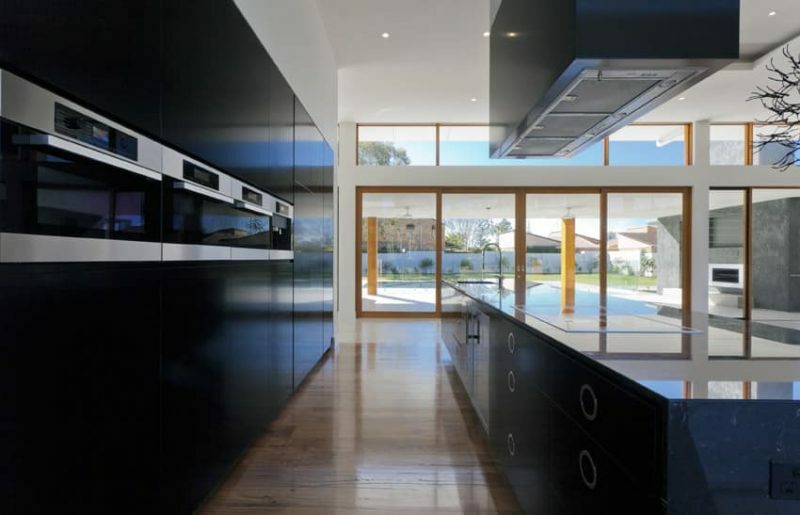 This kitchen is a great example of a modern kitchen space featuring charcoal-laminated kitchen cabinets. The cabinets come out well against the solid white walls and the plain white solid surface counters. 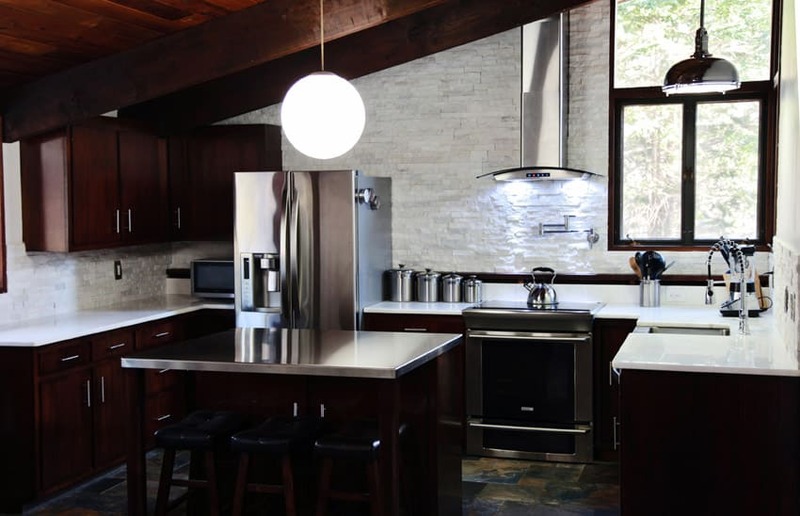 This modern u-shaped kitchen has black counters and white cabinetry with an amazing hillside view. Its open concept layout is perfect for entertaining and the layout is ideal for an efficient cooking/work triangle that allows one to look out on guests, rather than have your back turned. The raised ceiling with indirect lighting hidden in the molding looks stylish and appealing. 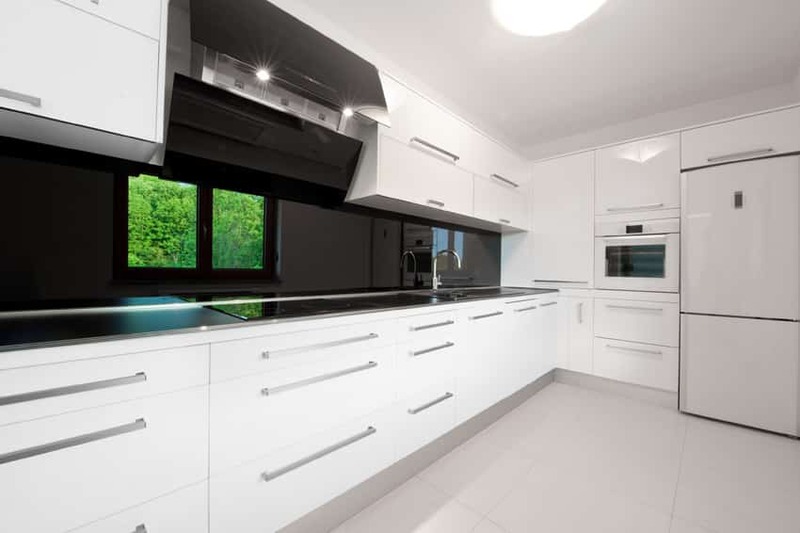 This is a black and white kitchen which fully utilizes the space for maximum storage and efficiency. All cabinets are laminated in a glossy white color, paired with brush stainless steel door pulls. To keep with the color scheme, even the built-in oven and the refrigerator are in white as well. For the countertop, black solid surface was used and paired with black back-painted glass for the back splash. 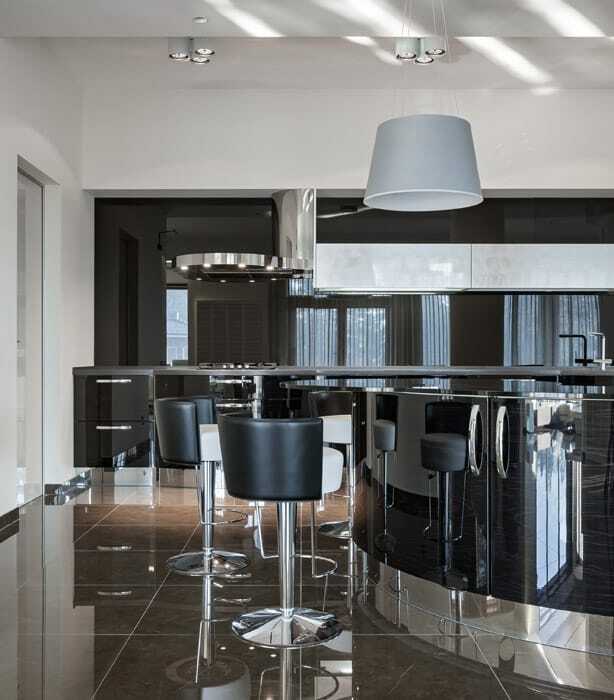 This is another ultra modern kitchen design which focuses on glossy materials and a simple black and white color scheme. You will see that the kitchen cabinets are laminated in glossy black with faux wood grain in gray. This is topped with charcoal black solid surface and paired with black graphicote glass for the backsplash. The overhead cabinets are in white and framed with stainless steel, matching the stainless steel kick space of the counters. This modern black and white kitchen is straightforward and functional, with beautiful base and overhead cabinets in solid white finish, with stainless steel handles. 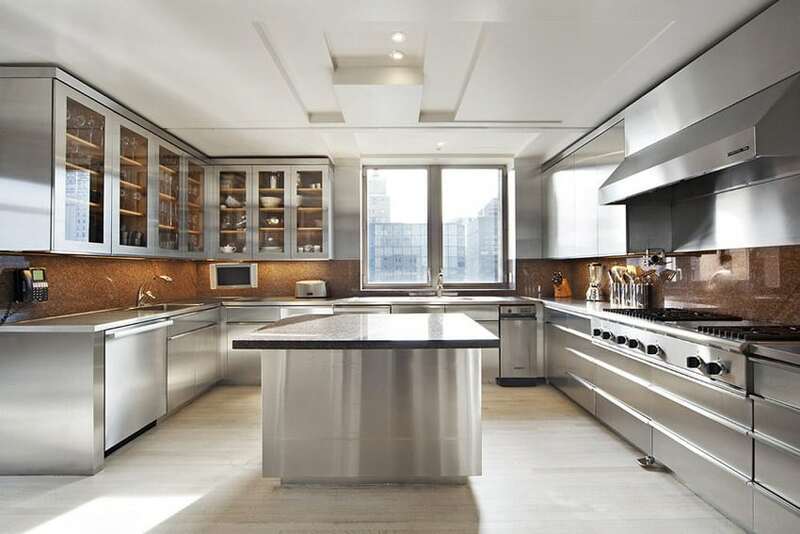 The countertop is covered with stainless steel, like the sink, oven, and stove. The backsplash alternates between solid black, white tiles, and stainless steel by the stove. This modern Asian kitchen has a variety of patterns and colors all throughout the space. The kitchen wall is fully tiled in beige granite, an the modular kitchen cabinets are pine laminated with J-channel pulls. This is topped with speckle-patterned ceramic tiles for the countertop. The kitchen island is clad in gray soapstone, and it is attached to a bar counter with wengue framing and mirror finish with fretwork sticker pattern. 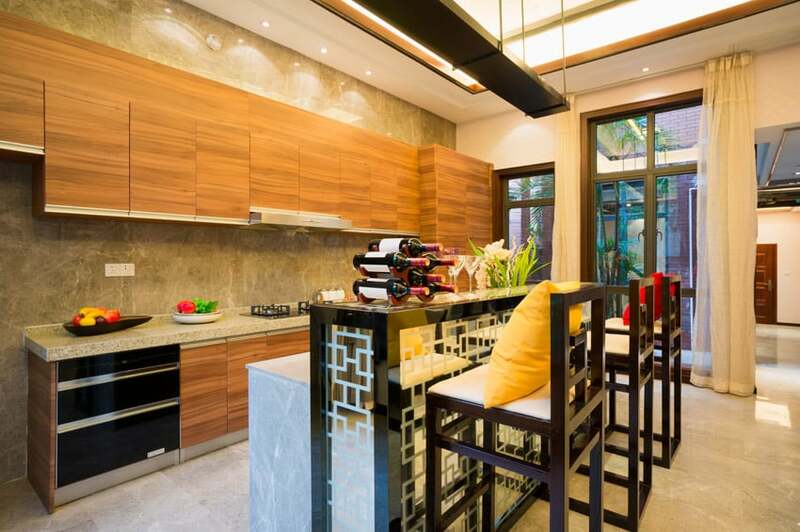 This gives a subtle oriental vibe to the kitchen and is even paired with Chinese-inspired wooden bar stools. With a small/limited available space, the open floor plan of this space helps make the kitchen look less crammed. The rest of the house is a plethora of colors and patterns, and the kitchen is not any different. 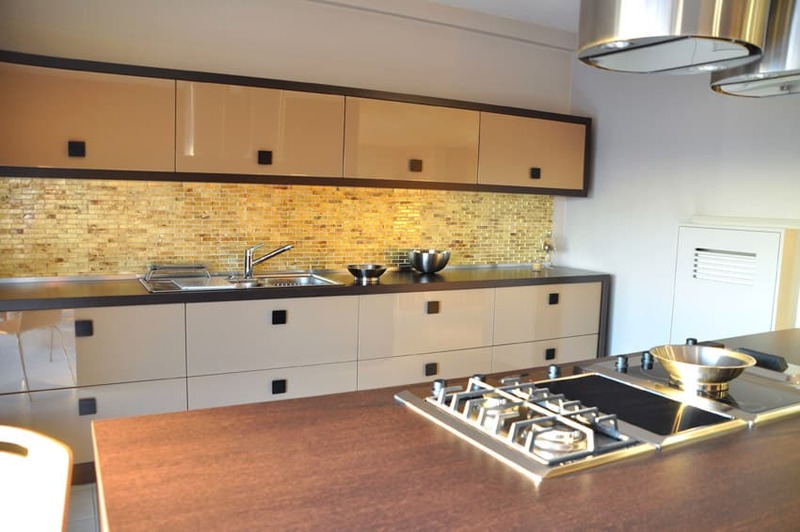 The modular kitchen cabinets combines modules with high-gloss black laminates, with base cabinets in glossy Golden Oak. 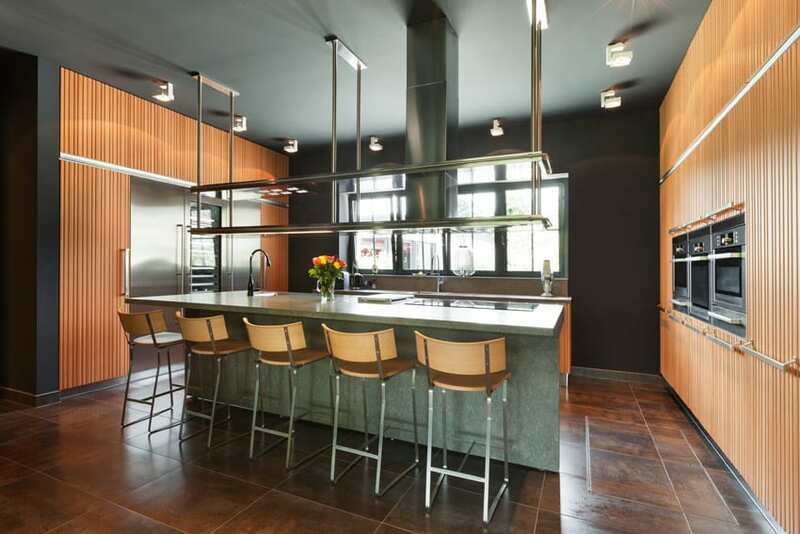 Even the counter top used is interesting – for the black kitchen island, matte black solid surface was used, while for the main base kitchen counter, graphicote glass was used on both the counter top and the backsplash, creating a very modern & seamless look. Simple paneled doors add depth and dimension to any kitchen space without weighing it down as it is not detail heavy. In this is example, solid pine wood kept in its natural color was used for the kitchen cabinets and is topped with black Galaxy granite counters. The backsplash of the cooktop was clad with stainless steel to keep the walls from getting stained with oils, moisture and other cooking residue. 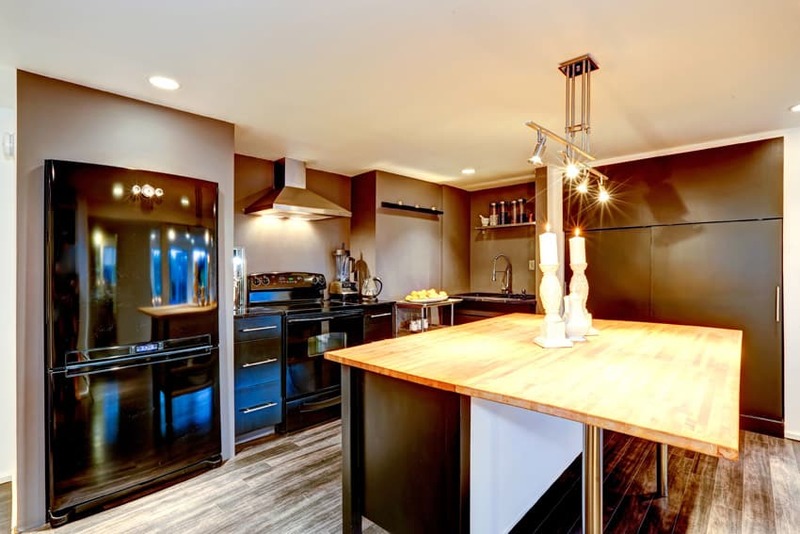 This kitchen has a dark and rustic feel to it, combining with with stainless steel and dark colors. The walls of this kitchen space is painted in a slate gray color, while the kitchen cabinets are all laminated in black and topped with black granite. 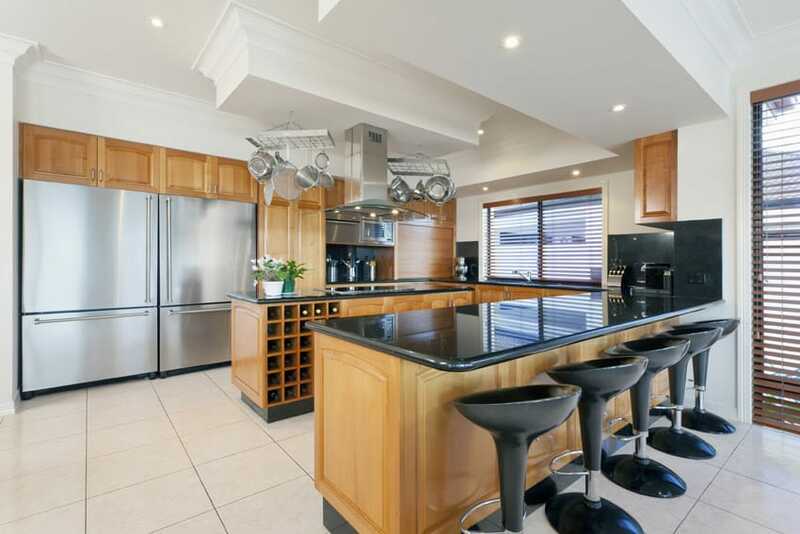 It has a large kitchen island with integrated bar counter/ledge, with black base, stainless steel legs and topped with solid oak butcher’s block. The combination of colors and textures give a rustic and manly appeal to the space. This modern kitchen design features white cabinetry with a grey granite counter for the main food prep area. A large rectangular island is placed in the center of the room. The island has a built-in stovetop and under cabinet storage. An interesting wood bar for eat in dining is attached to the end of the main island. Modern backless chrome bar stools provide seating for three. Additional polished metal furnishings such as the pendant lighting, range hood, drawer hardware, and appliances continue the theme. This kitchen has a more classic appeal to it due to its used of massive full-height cabinets and overhead cabinets in a dark rustic walnut color. This is combined with glass cabinet doors with wood framing & white solid surface counters and backsplash. The high ceiling of the space helps balance the dark wood colors used in the space, and maintain a bright and spacious look for the kitchen. This kitchen has a simple yet sophisticated appeal to it. It combines the classic appeal of solid natural oak paneled cabinets with the modern appeal of black. 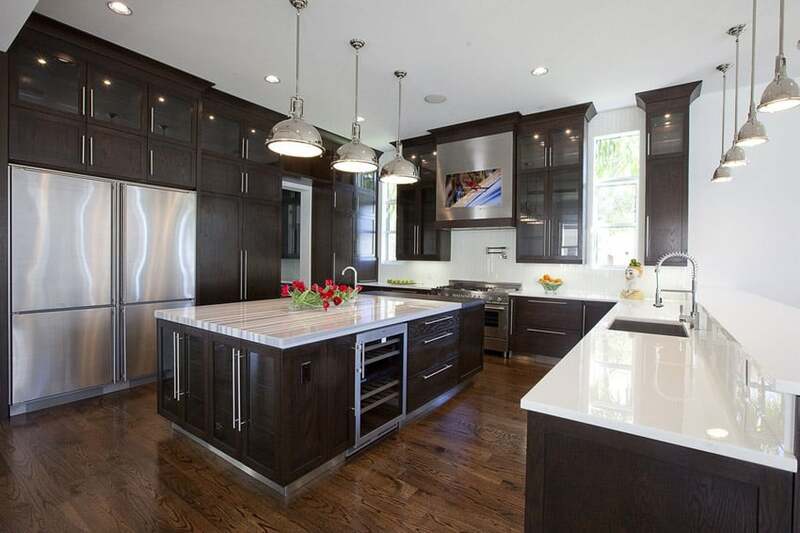 You will see that while all cabinets are in natural oak, the counter top and even the backsplash is in black granite. Even the kick space is painted in black and the bar stools are all in black as well. The contrast of the wood against black gives a sophisticated appeal. 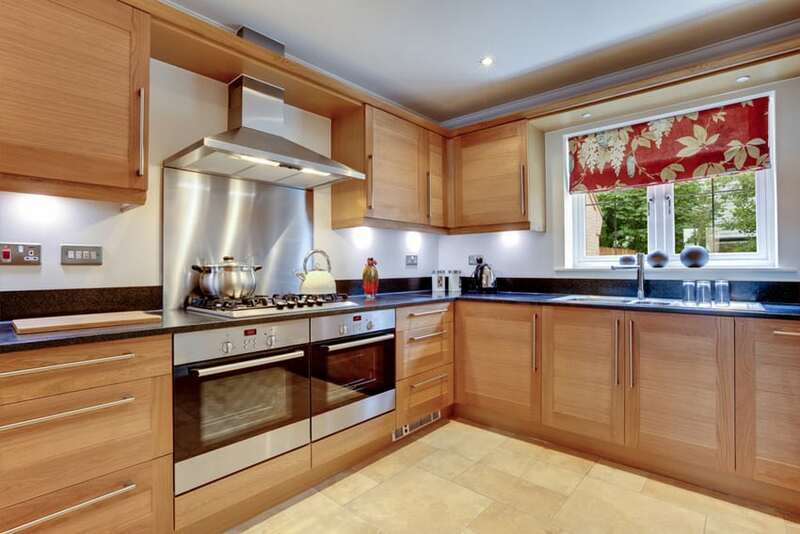 This kitchen makes use of golden oak wood laminates to create an inviting feeling, and a good environment to encourage more appetite in the kitchen. 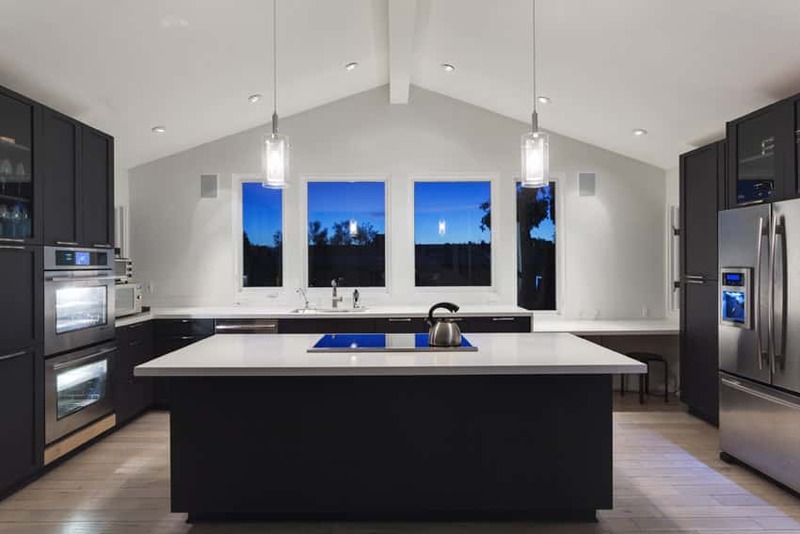 The walls are all-white and the ceiling is covered with exposed trusses in golden oak stain, where the lights are attached. An L-shaped pale golden oak base cabinetry covers the right side of the kitchen, where the countertop is covered with solid gray laminates. The refrigerator and oven are placed beside each other here. A kitchen island lies in the middle, with a pale golden oak wood base and solid black laminates for the countertop. This serves as a small place for dining, where black wooden stools are placed.